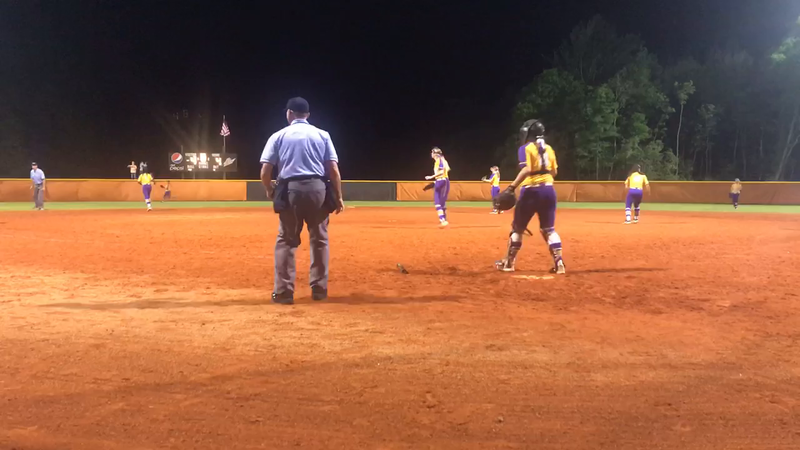 BAY MINETTE, Ala. - The Baldwin County High School softball team defeated Daphne 5-4 in eight innings. Kahalley Brooks was the winning pitcher. She went the distance, allowed six hits, seven strikeouts, and four runs in eight. Aspen Gerald was three for four with two RBIs and had the game winning hit in the bottom of the eighth inning. Ava Worthy was two for three with a walk, two runs scored and two stolen bases. Bailey Cox was two for four with one run scored, and an RBI double. Kahalley Brooks was two for three with a walk and two RBIs. Daphne took the lead 2-0 in the top of the first inning. Karsen Pierce walked, Lexi Adams singled, and Pierce scored on MC Swett's RBI single. Adams scored on a double steal. BCHS scored one run in the bottom of first inning. Ava Worthy singled, stole second and scored on Kahalley Brooks' RBI single. BCHS tied the game in the bottom of the third. Layla Hadley reached on a fielder’s choice, stole second base, advanced to third on a wild pitch, and scored on Aspen Gerald's RBI single. The Lady Tigers took the lead 4-2 in the bottom of the fifth inning. Ava Worthy walked, stole second base, scored on Bailey Cox's RBI double and Cox scored on Kahalley Brooks' RBI double. The Lady Trojans scored two runs in the top of the sixth inning to tie the game 4-4. Presley Williams singled and scored on a throwing error off the bat of Lexi Adams. Adams reached third base and scored on another error by the Lady Tigers. BCHS turned double plays in the top of the seventh and the top of the eighth innings and Daphne turned a double play in the bottom of the seventh inning. In the bottom of the eighth inning with Laura Weatherford on second base (international tie breaker rule), Layla Hadley sacrifice bunted Weatherford to third to set up Aspen Gerald's RBI double to score Weatherford for the game-winning run. BAILEY COX, BALDWIN COUNTY: Led the Tigers to four straight wins and the title of her school’s own tourney. Cox had three hits, including a homer, drove in three runs and scored three times in an 11-5 win over Lee-Montgomery. She added three hits and two RBIS in a 10-2 win over J.U. Blacksher and collected two hits, stole a base and scored a run in a 3-2 victory over Mobile Christian in the finals. Baldwin County also beat Flomaton 7-0. The Lady Tigers (23-13) will host Robertsdale on Monday, April 22nd at 7:00 pm for senior night. BCHS will honor seniors' Ava Worthy, Kahalley Brooks, Laura Weatherford, and Layla Hadley before the game at 6:35 pm. ALEA JOHNSON, FAIRHOPE: Hurled a complete game four-hitter and struck out 18 to beat McCracken County (KY) 9-1. She also provided the offense slugging s three-run homer for the Pirates. AINSLEY LAMBERT, SPANISH FORT: Hurled a two-hit shutout and struck out 14 to lead the Toros to a 6-0 win over Gulf Shores. She now has 261 strikeouts on the season.